Neumann & Heilemann was a company founded in the 1930s by Willy Hermann Neumann and Mr. Heilemann, two German people living in Japan. Willy Hermann Neumann had previously worked for Krauss in Paris, and Mr. Heilemann for Kenngott, then they helped Kazuo Tashima to found the Nichidoku company, later Molta (predecessor of Minolta). Heilemann left Molta in November 1931, followed by Neumann in 1932, who took some employees with him. They founded their own company, called Neumann & Heilemann Feinmechanisch Werkstätten Gōshi-gaisha (ノイマン・ハイレマン・ファインメハニシェ・ウエルクステッテン合資会社), using NH inside a circle as their logo. It was installed in a new plant in Takagi (高木), currently Ōmori-chō (大森町) in the city of Nishinomiya (西宮市), near the Mukogawa (武庫川) river. The company made the Neuheil, Rulex, Perfect and Perfekt shutters. 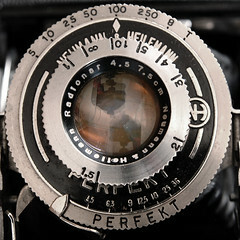 It also made Radionar and other lenses, certainly assembling imported Schneider elements in a locally-produced barrel. The company also became involved in the production of machine tools, under the influence of Willy Hermann Neumann, and they made an experimental motor tricycle. One of the company's last products was the Prince Flex camera (first Japanese TLR), first advertised in August 1937 by the distributor Fukada Shōkai. It is said that the body casting was bought from a sub-contractor, and that the final assembly took place in the Takagi plant. Neumann died in a motorbike accident in 1938 or 1939. Heilemann was suspected of spying during the war, and was imprisoned for some months in 1943. After the war, he built a small plant in Kōyōen (甲陽園), in the city of Nishinomiya (西宮市), and made various products, including a camera shutter called Heilemann, which met little success. The attribution of the Condor folders to Neumann & Heilemann is a mistake. The Heilemann shutter (5–250, B) was made after the war by Heilemann alone. It has three blades, a setting lever and an ASA synch post, and was mounted on the Monte 35. A Neuman shutter (single "n"), giving B, 1–250 speeds and inscribed NEUMAN OPTICAL WORKS, is known on the postwar Royal Senior but is probably not related to the Neumann & Heilemann company. All these lenses were certainly assembled from imported elements, probably supplied by Schneider for the Radionar. ↑ Career of Neumann and Heilemann before entering Nichidoku: Tanimura, p.96 of Kurashikku Kamera Senka no.12, and Awano, p.1 of Camera Collectors' News no.114. ↑ Tashima, Watakushi no rirekisho, quoted in Andō, p.2 of Camera Collectors' News no.127. The dates are repeated in Tanimura, p.96 of Kurashikku Kamera Senka no.12, and Awano, p.6 of the same magazine and p.1 of Camera Collectors' News no.114. ↑ Dates and company name: Tanimura, p.96 of Kurashikku Kamera Senka no.12. The company name is confirmed by an extract of the Kōbe Shinbun (27 September 1937) reproduced on p.99 of the same source. ↑ Tanimura, p.97 of Kurashikku Kamera Senka no.12. ↑ Tanimura, p.50 of Kurashikku Kamera Senka no.11, says that Schneider lenses were imported as separate elements and were assembled in Japan. Awano, p.2 of Camera Collectors' News no.114, says that the Neotar f/4.5 and Radionar f/3.5 lenses of the Prince Flex were perhaps imported as separate elements or already mounted in a barrel, but that the tariff structure was favourable to local assemblies from separate parts. ↑ Tanimura, pp.98–9 of Kurashikku Kamera Senka no.12, partly based on the testimony of a former employee of the company. ↑ Tanimura, p.439 of Kokusan kamera no rekishi and p.98 of Kurashikku Kamera Senka no.12, based on the testimony of a former employee of the company. ↑ Neumann Seiki: Tanimura, p.99 of Kurashikku Kamera Senka no.12. Neumann & Heilemann dissolved on 11 September 1937: extract of the Kōbe Shinbun (27 September 1937) reproduced in Tanimura, p.99 of Kurashikku Kamera Senka no.12. ↑ 9.0 9.1 9.2 9.3 9.4 Tanimura, p.99 of Kurashikku Kamera Senka no.12. ↑ Tanimura, p.51 of Kurashikku Kamera Senka no.11. ↑ Mistake in McKeown, p.717. Most Condor folders have a Rulex shutter made by the company. ↑ The Heil shutter, normally associated to Riken products, is attributed to Neumann & Heilemann in Shunkan o torae-tsuzukeru shattā-ten, p.19. ↑ Examples pictured in this page at ksmt.com, and in Hibi, p.65 of Kurashikku Kamera Senka no.8. Awano Mikio (粟野幹男). "Minoruta ryakushi" (ミノルタ略史, "Minolta short history"). Kamera Rebyū: Kurashikku Kamera Senka (カメラレビュー クラシックカメラ専科) / Camera Review: All about Historical Cameras no.12, October 1988. No ISBN number. Minoruta kamera no subete (ミノルタカメラのすべて, special issue on Minolta). Pp.6–8. Awano Mikio (粟野幹男). "Purinsufurekkusu" (プリンスフレックス, Prince Flex). In Camera Collectors' News no.114 (December 1986). Nishinomiya: Camera Collectors News-sha. Baird, John R. The Japanese Camera. Yakima, WA: Historical Camera Publications, 1990. ISBN 1-879561-02-6. Hibi Takashi (日比孝). "Nihon no supuringu kamera: Orinpasu" (日本のスプリングカメラ・オリンパス, "Japanese folding cameras: Olympus"). Kamera Rebyū: Kurashikku Kamera Senka (カメラレビュー クラシックカメラ専科) / Camera Review: All about Historical Cameras no.8, September 1986. No ISBN number. Supuringu kamera (スプリングカメラ, special issue on spring cameras). Pp.62–5. Kamera no mekanizumu sono I: "Hai! Chīzu" Shunkan o torae-tsuzukeru shattā-ten (カメラのメカニズム・そのⅠ・「ハイ！チーズ」瞬間をとらえ続けるシャッター展, Camera mechanism, part 1 "Cheese!" Exhibition of instant taking shutters). Tokyo: JCII Camera Museum, 2002. (Exhibition catalogue, no ISBN number) P.19. Watakushi no ni-gan-refu kamera-ten (私の二眼レフカメラ展, Exhibition of twin lens reflex cameras). Tokyo: JCII Camera Museum, 1992. (Exhibition catalogue, no ISBN number.) P.25. This page was last edited on 13 February 2015, at 20:12.